"If you have resistance to something, it means there's something wrong. The resistance to me is a sign of fear"
"Try to find the path of least resistance and use it without harming others.... "
Why do so many of us struggle and resist? We struggle with questions. We struggle to accomplish things, we struggle to make things happen. Some say that all of life is a struggle. Life is not a struggle and never has been a struggle. Stuart Wilde has said that “Struggle is effort laced with emotion”. Yes, many, many people do struggle. We have all struggled at one time or another. We have been trained to struggle, to think that progress takes struggle and so to create anything of value takes a struggle. But to struggle is not natural. It doesn't exist in Nature, all animals on this planet exist in alignment with their world. They eat, sleep, reproduce and die. Animals don’t struggle or whine they just wander about and eat. Maybe they eat seeds or they eat other animals, but they eat. No problem. Their food is either walking around, lying on the ground or hanging from a bush or tree. They eat then they fly off somewhere or crawl into a hiding place and take a nap. A few hours later they may set off and do the same thing again. All the while watching, staying alert but not worrying. Most of us in the western world have it just as easy. We don’t necessarily have to worry about being eaten but we still find reasons to complain. Our lives could be very simple but we prefer to complicate them with requirements and needs. So we struggle. Struggling is really just resistance. 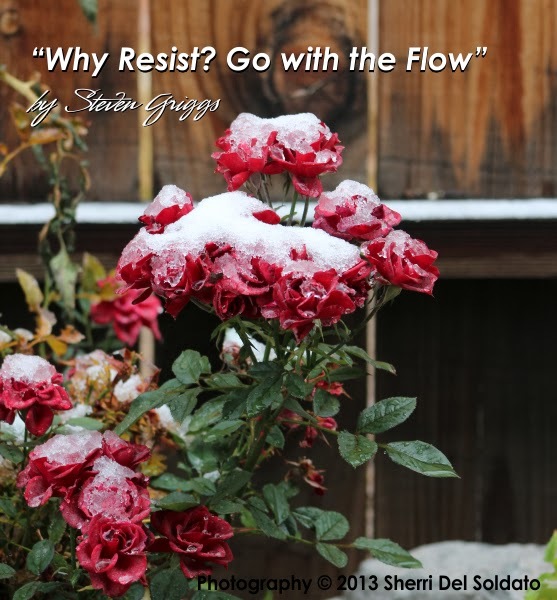 You resist going with the flow because it seems too effortless. It actually seems almost like laziness. And that would not be acceptable. To resist means to keep hanging on to the ego personality’s definitions, hanging on to its safe routines and rhythms. Some time ago I spoke with a friend and his wife who told me they were writing a book. I’d see them at different social events and we would chat. I would always ask how the book was coming along and they would, very seriously, tell me of all the problems and difficulties they were having, about how the universe was constantly testing them by creating obstacles to overcome and problems to be solved. Then they would tell me, with very sad and sincere faces that they were going to persevere, that in the end they would win. I didn't say anything. There was no point. This was their path, their “struggle” and you can’t interfere with other people’s stuff. But the truth is- first of all the universe isn't something out there it’s in here. Inside us. And secondly the universe doesn't test. It doesn't do anything to you. "It" merely responds to your energy and thoughts. It acts as a multiplier or magnifier of what you put out there. That can be seen as struggle because, in their case, what they we were receiving contradicted with what they were trying to accomplish. On a conscious level that is. The problem was, somehow on an unconscious level they weren't really in complete alignment with that goal, they were forcing the writing of the book. So they were having problems and feeling blocked. A bit like trying to force a square peg into a round hole. The lesson here is to pay attention to your progress, to the amount of resistance you are receiving. If you feel no resistance and things seem to be racing along, you are in the flow. You will be able to see it or feel it and that is the best way to know that you are not in alignment with that particular goal. Take a look to see what is causing the resistance. You might need to adjust slightly or maybe even a lot. You may need to reconnect emotionally with the goal. If you can't or it seems difficult to connect then you'll know you're not resonating with that particular goal. But watch to see if you are in the flow. Usually if you truly wish to accomplish something and you are excited and truly engaged with the goal and take strong action, you will be on your way. But if things get clogged up and you see resistance, reevaluate and make changes. Don’t pound away at something just because you “want” it to happen.